As we're getting deeper into the fall season, I have been taking a gander at some of the latest fall trends. I love exploring the trends in fashion as well as makeup and it looks like this year, the dark lip has returned. Last year, I really embraced this look and since it's back again, I know just the lippies to grab from my stash. In fact, two lipsticks I have in particular were the first to come to mind and the great part is you can get BOTH for $4. 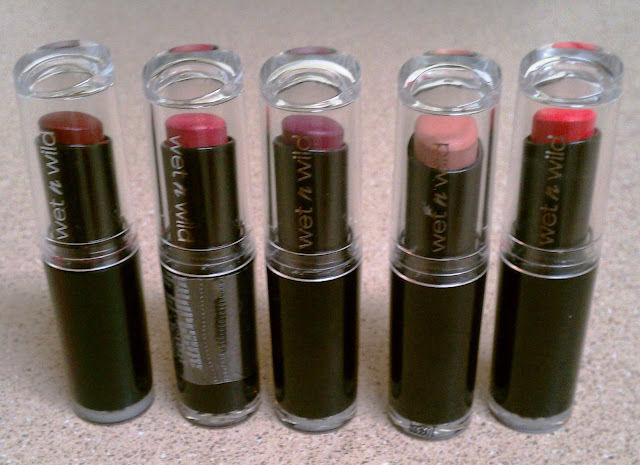 If you saw my review of Wet 'n Wild Mega Last Lipsticks, then these colors will be no surprise to you. The two colors I'm referring to are Cherry Bomb and Raivin' Raisin. Raivin' Raisin: A lighter purple. I love both of these shades, but Cherry Bomb is my personal favorite! These colors are definitely in style and with Wet 'n Wild, they are always affordable and long lasting. Are you into the dark lip trend? Click here to see if these are on sale in your area. P.S. Vote for this article on Lucky Magazine's Community page here. I love this trend. I'm just afraid of buying the wrong colour lipstick to match my skin tone. I've never actually bought lipstick. What tips do you have? Hey Audrey! Thank you so much for stopping by my blog. I definitely think lipstick can be worn by any woman and the great thing about women of color is that we can wear a variety of shades. I think great colors on you would be peachy nudes, plum, brick red (like Cherry Bomb) and deep orange. I would also invest in lipsticks that last awhile. I love Wet & Wild because they literally do last at least four hours on your lips. I don't wear lip stick BUT I keep hearing good thing about wet and wild. I might pick up a few since they are buy one get one free. I guess it never hurts to play in makeup every once in a while. I love the Raivin' Raisin on you! This trend is so gorgeous on other people, but I know it wouldn't look good on me. What?! I think it would look great on you! A great plum or red color... Come on! I love the look! I always felt I looked good in a plum lip...so these colors are right up my alley. While I haven't tried this trend, I love the colors and you wear them well! Very pretty, sis! I'm loving plum lips this season! Both of these colors look great on you too. I have to go pick up that Ravin' Raisin to add to my collection! I love the deep plum red but both look great on you! The Cherry Bomb looks great on ya! Heading to CVS tomorrow! I love W & W, my friends and I rocked it back in the day when it wa only 99 Cents. We wore the heck out of the blackberry one in HS. I love the colors! I love Wet & WIld, it's budget friendly and you can get a lot of colors that you find at MAC and other places! You wear the dark lip very well. I haven't tried it as of yet, but definitely considering. I'm more into pinks right now. Oh I really love those colors! You are making me want to go out to CVS today! I saw a makeup guru on youtube also do the cherry red lipstick look for this fall and because of this blog post I am even more inspired to go pick one of these up. It goes on VERY smooth. I love it! For a very long time, I was afraid to try darker bold lips. Once I did get into it though, there was no stopping me. I think I own most of what you mentioned...I love the trend! it´s excellent, i´ll be back soon. WOW! I love that 1st picture! I have to post that on my FB page. What color is it? Hey Kiah! Thanks for stopping by my blog. :) It is Wet 'n Wild's Cherry Bomb lipstick. I actually just got into the pinks. I've been so afraid to try this because my lips are so full but these colors are enticing me to do so. And Wet n Wild is definitely affordable enough for me to try it without breaking the bank. I like that Raisin color! I'm going to the ol' ye faithful this fall...burgundy!!! Lovin the purple color, it is gorgeous and I'll be checking out Walgreens to see if mine has it in stock. I love these dark lip trends!! I love both of the colors. Wet n Wild lipsticks are super awesome.